Two thousand years ago the Creator Yahweh predicted as following through the Prophet Jesus that the Messiah who will save humanity would be sent to the earth in the future. 「2000 years ago Prophet Jesus definitely said that the Holy Spirit will be sent not by Prophet Jesus himself but by the Father, a creator Yawheh, and when the Holy Spirit comes to the earth, this man will prove Prophet Jesus. And Prophet Jesus predicted the Holy Spirit would reprove the world of sin and of righteousness and of judgment, and this man would guide to all truth, speak not in his own will, but according to what he heard from a creator Yawheh, and foretell the future.」 This message suggests a commandment that A Creator Yawheh gives humanity and churches through Jesus as a criterion about the right ways to diffuse the message and receive guidance from the Messiah. Then who is the Holy Spirit? Let's recognize and welcome the Messiah Rael, the world spiritual leader who guides humanity to the new scientific civilized age, and make this planet paradise in order that self-destruction of the earth which can happen because of atomic weapons and arms race of the world powers may be prevented and lofty spirituality of eternal peace and harmony may be settled down on the earth. Especially the true Jews should have an insight into the following. Israel has prepared the coming of extra-terrestrials nationally. 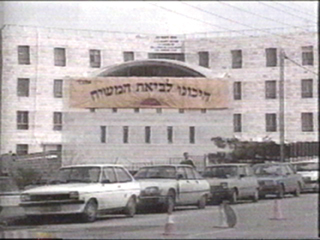 On Aug. 4, 1982 opening ceremony of Jerusalem Great Synagogue was held in Jerusalem, Israel where Israeli government officials, political leaders and religious leaders, world leaders and rabbis of Judaism attended. This opening ceremony was carried live not only to Israel but also to the world. 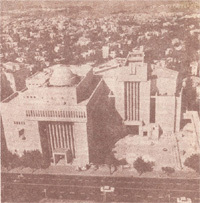 Jerusalem Great Synagogue was constructed at a cost of USD 4.5 millions. 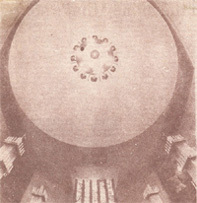 Maurice Jaffe, chief priest of Jerusalem Great Synagogue said "This Great Synagogue is the most beautiful synagogue which cannot be compared with Taberuacle that had been built in Israeli wilderness after exodus, prepared 60 years ago by two rabbis, Hacohen Kook and Yaacov Meir. And Hegal Solomon, chief of Jerusalem Great Synagogue delivered a congratulatory address "Now we are in the time of welcoming prophet Elijah." The following mentioned in Book of Malachi 4:5~6 is the prediction of the destiny of Israel through Elijah who will be dispatched to the earth in the future by the Creator Yahweh. The true Jews and humanity need to understand that Elijah mentioned in Malach chapter 4 means not the very Elijah who ascended to heaven by chariot of fire and horse of fire (UFO), but the new prophet who will diffuse the message of the Creator Yahweh. Though 36 years have passed since Israeli government built Jerusalem Great Synagogue for welcoming Elijah, the reason why Elijah did not come back yet is because the Creator Yahweh has already sent the Messiah Rael to the earth. The prophet Elijah will come back with the Creator Elohim when the Messiah Rael builds the last and Third Temple, Elohim's Embassy in the earth. Many times the Messiah Rael has already let Israeli political and religious leaders know that he is the last prophet dispatched by the Creator Yahweh. pay attention to what the Messiah Rael has done for the past 40 years." You will know that the Messiah Rael has performed throughout the world his mission to save humanity. We need to take note of the social and religious changes in Israel which severely affects politics, economy, religion and science of this planet. Let me introduce many changes which happen in Israel. In 1993 a religious sect of Judaism announced that the Messiah has already come to the earth. 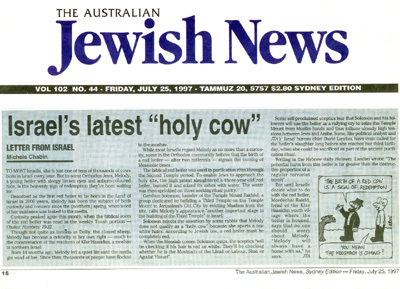 In the early 1990s in Israel there was a report that a brindled cow gave birth to a white calf. It snowed heavily in Israel where it had never snowed before. And Iraq attacked Israel with missiles. According to Israeli religious tradition these strange phenomenon mean the signs of the coming of the Messiah who humanity has waited so long time. 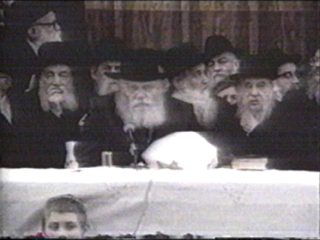 In 1993 finally Shuniesun, one of the highest rabbis announced that the Messiah has come among us. 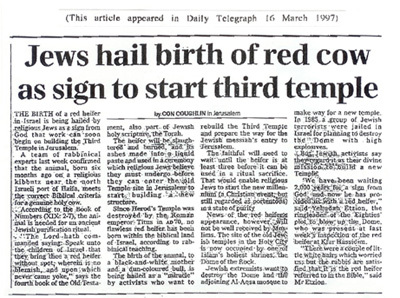 "The Jews cheer for the birth of a red calf as the sign of building the Third Temple"